'Twas the month before Christmas, and although the land, no DC title broke the Top 6, except for Batman.' Factual and it rhymes - talk about your double word score! In November 2014, Peter Parker's Spider-verse crossover event spun into first place, pulling Spider-Woman #1 in through riding its web. This again saw DC beaten by Marvel in terms of unit share, this time, by 6.18%. Now, on to the Top 6! 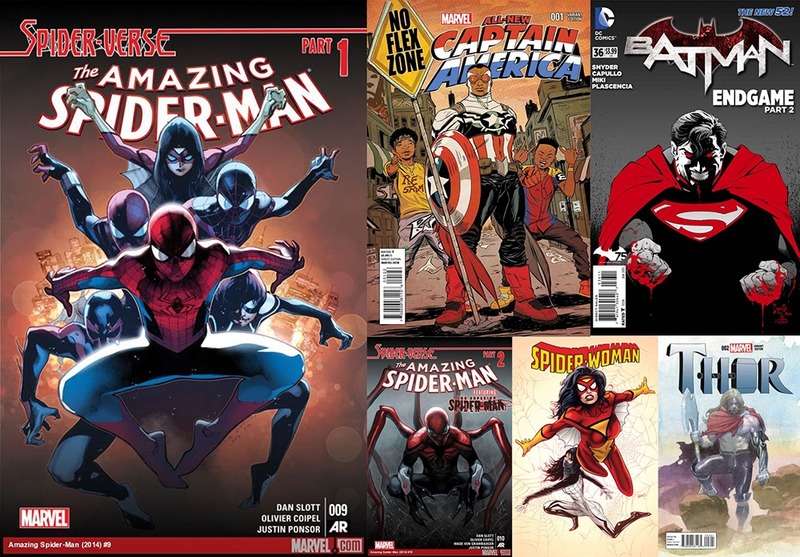 THE TOP 6 COMICS FOR NOVEMBER 2014: 1) AMAZING SPIDER-MAN #9 2) All-New Captain America #1 3) Batman #36 4) Amazing Spider-Man #10 5) Spider-Woman #1 6) Thor #2 - Full stats after the jump. MY THOUGHTS: I (heart) Jessica Drew, and seeing her name in the Top 6 gets me giddier than a Taylor Swift fan listening to Shake It Off. If only it hadn't been such a horrible issue, it would be a moment to dance to. The downer wasn't Greg Land's art either, as he has taken serious steps back towards his Nightwing-not-so-photo-reliant style. There was just too much Spider-Verse not enough Jessica. Great tie-in, but stink #1. Shake It Off indeed. TOP COMICS OF NOVEMBERS PAST: Superman: The Wedding Album Collector's Edition unknowingly created the need for future Crisis' as #1 in 1996. JLA/Avengers #2 was still humming along flawlessly in 2003, and a Masters of the Universe #1 from Image Comics, held the power of Grayskull above all overs in 2002.